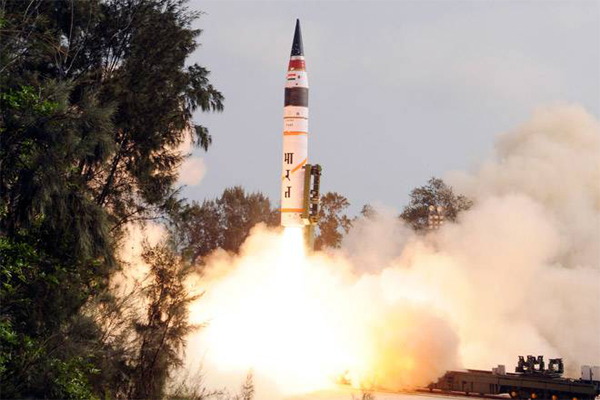 India’s indigenously developed nuclear capable missile Agni 5 has passed its trial fired at 1:30PM from Abdul Kalam Island at Dhamra in Bhadrak, Odisha. The surface-to-surface ballistic missile capable of carrying 1500 kg capacity traversed a distance of 5000 kilometres. This is the seventh trial according to the defense ministry sources. According to a defense ministry source, “The missile was launched with the help of a mobile launcher from launch pad-4 of the Integrated Test Range (ITR) at Dr Abdul Kalam Island in the Bay of Bengal on Monday afternoon”. The source added, “It was a user associated trial. Strategic force command along with DRDO scientists conducted it”. In the ongoing trial, the missile was guided by an on-board computer system with the support of laser gyro-based inertial navigation system, Micro Inertial Navigation System (MINS), fully digital control system and advanced compact avionics. The missile hit the target spot on accomplishing the mission. India currently has in possession – Agni-1 with 700 km range, Agni-2 with a 2000km range, Agni-3 with 2500 km and Agni-4 with 3500km range. India first test fired Agni 5 on April 19, 2012.